Testy early: Ryan goes after Obama's response to the Libya attack in particular and foreign policy in general. Biden breaks in: "With all due respect, that’s a bunch of malarkey, because not a single thing he said was accurate." One of the things Ryan said: Obama's Mideast policy is "making the world more chaotic and us less safe." Unemployment: Ryan points out that unemployment in Biden's hometown of Scranton is 10%, up from 8.5% since Obama took office. “That’s how things are going all across America,” Ryan said. "That's not how things are going," Biden chimed in. Ryan's line "might have been one of the most powerful punches he threw all night," writes Rosalind S. Helderman at the Washington Post. Ryan zings: "I know you're under a lot of duress to make up for lost ground, but I think people would be better served if we don't interrupt each other," he said in a clear reference to Obama's debate performance. Full transcript: NPR has one from the Federal News Service here. So how did it play? Probably depends on your party, notes AP. GOP strategist Karen Hanretty likened Biden to the "crazy uncle" at Thanksgiving, while Sen. John Kerry tweeted that "by the end of this, Ryan may vote for Joe." So you repeated all the Ryan's lie and even didn't tell what Biden reply. You are pathetic. Well Tax cut on rich doesn't create jobs. All those tax cut goes to invetsments abroad. What creates jobs is the middle class purchasing power. If you want to do tax cut on corporations you should at least relate it with outsourcing and do tax cut for those corporations that at least outsource less. Tax increase on rich doesn't kill jobs either. If you use this money for stimulating high tech or road construction it benefits US technology infrastructure and goes back to increase purchasing power and creates even more jobs. Now it is important that middle class can create in its environment new agressive ambitious businessmen and challenge the big business. Old big established business usually become lazy it is not middle class becommeing lazy it is those rich people who are. And we need redistribution of wealth form old conservative business to new innovative. I don't have time for the rest of Ryans malarka, just this one that is the most important. 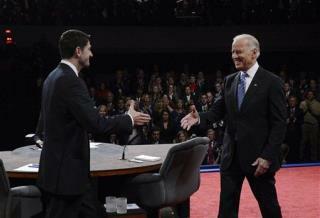 (R) The 2012 ELIZABETH EMKEN for US Senator of California: Last night's Biden vs. Ryan debate, the first 25 minutes, I lost my patience because Joe Biden was too much interrupting, being a US Vice President, Biden was acting all kinds of grinning cheekily, laughing and grimacing. Paul Ryan, YOU passed your Comprehensive Exams in your VP capability and strategy. Anyway, I just complete my 2012 duty to cast my Vote by Mail Ballot for a BETTER TOMORROW's California at the 8th (or 9th) Global Economy in the world. Good luck to Romney-Ryan ticket and good luck to (R) 2012 Elizabeth Emken for US Senator of California.